I really wanted to try something different tonight. I’ve been taking a lot of Landscape shots recently, and while I love that genre, I think I need to try new things. Now I would do more portraits, but other than my family, I’d have to go out and actually find someone to shoot, and to be completely honest, I’m just too lazy. As a result I have lots of family shots but not much else. (Need to do something about that). Anyway, for tonight I thought I’d try food photography. Never tried this before so this is a complete experiment. I didn’t know what I wanted to shoot so I went to QFC and walked around with a basket looking for something interesting. Oh sure I brought fruit (every kind of berry) but I was still looking for something new. Then I found these peppers. I immediately thought they would look great on white paper (loved the red and orange colors) so I grabbed a handful and rushed home. Then I spent two hours setting up food shots. I played around with these peppers first, then did some berry shots, dropped some strawberry’s in water and finished with food coloring. Phew! I’m pretty pleased with the results (for a first attempt) but ended the night with pepper burns in my nose (don’t cut peppers then pick your nose – huge mistake), and food dye all over my fingers (red and green, my hands look like a Christmas Tree). 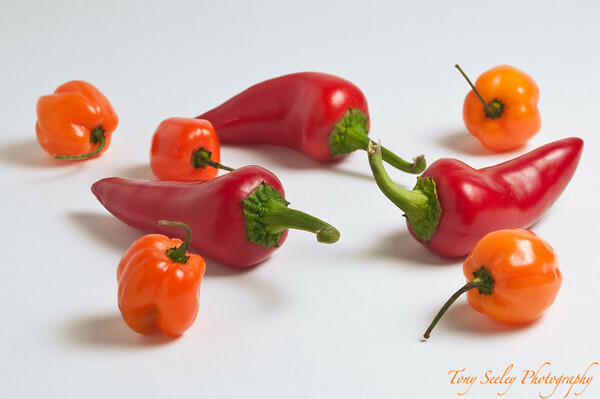 After my shoot the Halo guys found the peppers with terrible results! Apparently they are pretty hot! Not a great day for a picture. 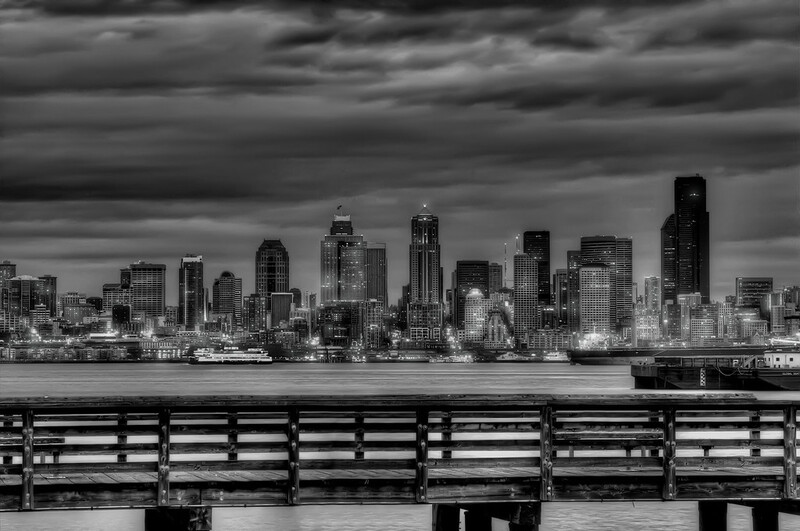 Still raining with grey sky’s etc., so I thought a black and white skyline shot was in order. For this I visited Alki Beach in West Seattle. Alki is on the peninsular that’s directly opposite Seattle Down Town on the other side of Elliott Bay. This is a great place to roller blade or bicycle and is scattered with coffee shops and restaurants. (Our favorite place is Salty’s that overlooks the water). This shot was taken right by Salty’s and as there was a lot of traffic in Elliott Bay I had to wait for an opening to get the city. That said you can see the Ferry coming in from Bainbridge Island. As it was just getting dark the city lights are starting to come on and it adds a nice collection of lights to the image. Abi has hundreds of these “Littlest Pet Shop” Toys (and I mean hundreds) here they ganged up on our Halo heroes. I went out with the camera today to see what I could capture but it was a bit miserable again. Rain with grey skies. Anyway I went over to west Seattle to Alki Beach and found this pier with some boats propped up on the railings. 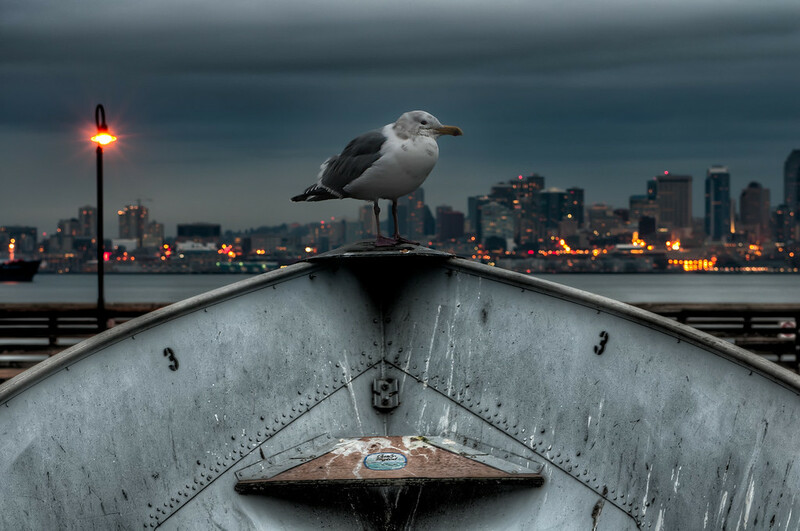 Sitting on the top of one of the boats was this seagull. 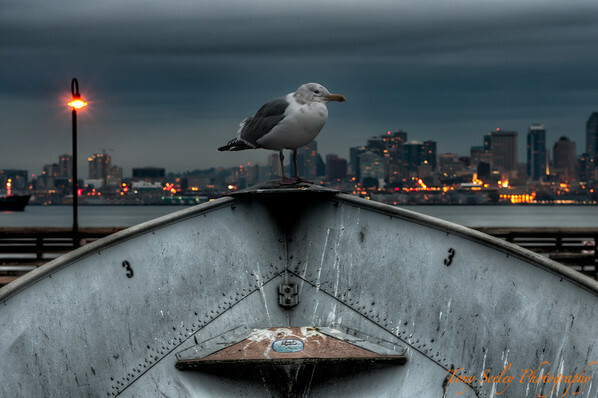 Anyway I decided to set up the camera and take this shot as behind the bird was the Seattle skyline and the sun was just going down, so building lights were coming on. I took several shots and the bird kept moving and the light was low so I needed a long shutter. When I got home I checked out the pictures and found one with the bird staying reasonably still. But when I examined the image I saw the boat was covered in bird crap! I suggested to Lisa that I should throw the image away but she liked it and thought it was funny, so here it is. These Halo guys have no fear, they just throw a rope to the top of one of Lisa’s glass ornaments and started to climb! As a result I decided to find somewhere inside and found the city’s public library. 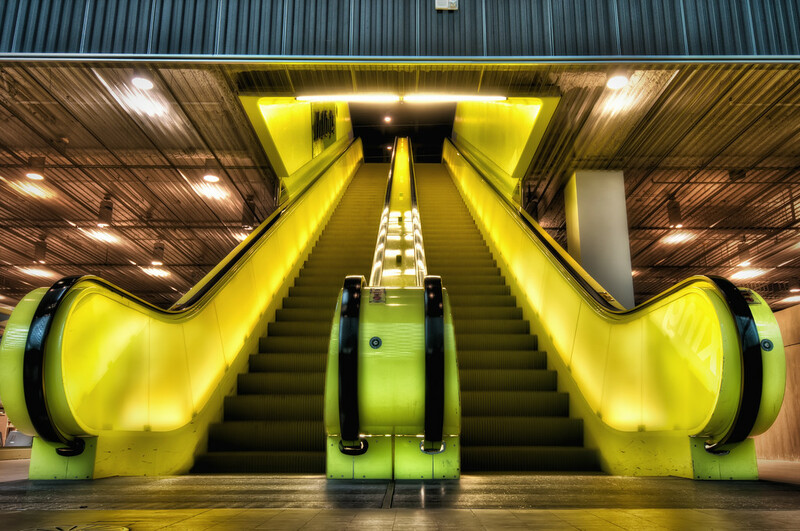 Inside they have these amazing escalators that are lit with yellow lights. I must have looked a complete idiot lying on the floor waiting for people to get off the thing but nobody complained. I did ask a passing employee if it was OK if I shot in there and he just smiled and said no problem as long as I don’t bother anybody. The funny thing was I had to wait a while for an empty escalator shot and while waiting some guy came up to me and asked if I wanted a model for $10! Obviously (as you can see) I politely declined. Always trying to keep amused tonight the guys played hide and seek. When I visited the Museum of Flight I was getting some great shots of the planes inside the museum but was getting some really nasty looks from the other people there with cameras who had neglected to bring a tripod. After an hour or so inside I decided to take a break and check out what was outside. 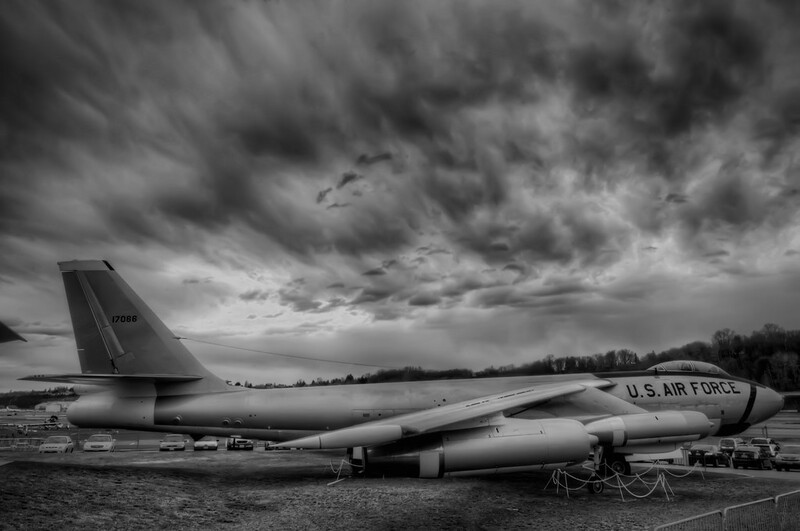 Right outside the museum was this Stratojet. While the plane looked pretty cool the sky above it was amazing. When I took the image I was thinking it would look pretty good in black and white, and as I haven’t posted a B&W picture yet, here you go.